FOXBOROUGH - It started, as many good ideas do, with a simple question - and a bit of resistance. University of Colorado offensive line coach Jeff Grimes had his eye on one of the Buffaloes’ tight ends, a tall, thin sophomore named Nate Solder, who had played in all 13 games the previous fall, primarily as a blocker. So Grimes asked head coach Dan Hawkins if he could approach Solder about playing on the offensive line. Hawkins signed off, and Grimes sought out Solder. “I told him, ‘You can play a little at tight end or you can come work with me, be a left tackle, and in three years you can be a first-round pick,’ ’’ Grimes recalled yesterday. “I pulled out a number of articles, guys who had started as defensive ends and transitioned to offensive linemen, tight ends who did it. That day, Solder weighed 265 pounds, and, according to Grimes, had just 2 percent body fat. Always health conscious, Solder was worried he’d have to get “big and sloppy,’’ as Grimes put it. But the coach assured him he didn’t need to weigh 350 pounds, only around 300, enough to deal with the defensive linemen with whom he’d be tangling. “He came back three days later and said, ‘OK, I’m ready to do it,’ ’’ said Grimes. In a matter of months, Solder put on 35 pounds of lean body mass while increasing his body fat percentage only slightly. When Grimes asked how his new pupil was gaining weight so effectively, Solder revealed that he’d bought six nutrition books - actual textbooks, not magazines or weightlifting guides - and read them cover to cover. Solder isn’t doubting Grimes now. Just as Grimes said, three years later Solder was a first-round draft pick, part of a strong tackle class that included Boston College’s Anthony Castonzo (Colts) and Southern Cal’s Tyron Smith (Cowboys). New England made Solder the 17th overall selection in the 2011 draft, the first time since 2005, when it took Logan Mankins 32d, that it chose an offensive lineman in the first round. Despite not having the benefit of spring camps to learn the ins and outs of the playbook and work with offensive line coach Dante Scarnecchia, Solder was pressed into duty in the first game of his first regular season when starting right tackle Sebastian Vollmer couldn’t play because of a back injury. Not only did Solder start, he was challenged with keeping Miami’s Cameron Wake, one of the NFL’s top pass rushers last season, away from Tom Brady. And he was at right tackle, not left, where he had little experience. Solder not only kept Wake at bay, he drew raves for his play. He has started four of the Patriots’ five games since, as Vollmer continues to work his way back (the veteran suffered a setback against San Diego in Week 2). The man who lines up on Solder’s left shoulder, Brian Waters, has been in the NFL for 12 seasons. He joined the Patriots just before the opener, and doesn’t mince words when it comes to Solder. “I’ve been around a couple of young tackles. Nate has done exceedingly well,’’ said Waters. “He doesn’t get overwhelmed. There’s not a time in the game when you look at his eyes and he kind of has those ‘doe eyes’ where everything is going too fast. You don’t see that with him. He’s really confident and skilled but he has a really calm nature about things. The qualities Grimes saw in Solder are the same ones that serve him well now. “I saw a kid that had decent, average athleticism as a tight end, but you take that same level of athleticism and put it on O-line and it’s off the charts,’’ said Grimes. His speed, foot quickness, there are very, very few guys out there that have that kind of athleticism. Looking at his frame, I knew he could carry weight. Displaying the humility of which Grimes speaks - and the tight lips required of any Patriots rookie - Solder says he only wants to improve, and that he has a long way to go. 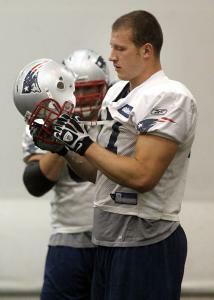 Waters isn’t afraid, even at this point, to call Solder “exceptional,’’ though he also says the rookie has work to do. Grimes expects that he’ll be an All-Pro someday. As for Solder, who leans on Vollmer for advice and says the Patriots need Vollmer back even though it would relegate him to backup, he’s just taking it all in - and doing what he can to protect Brady. Globe 10.0 Bigger bust, Ochocinco or Haynesworth? Globe 10.0 Brady-Belichick the best combo ever?